Ever dream of carrying the entire solar system around in your pocket? Now you can with a little help from the 3D printing company Little Planet Factory. 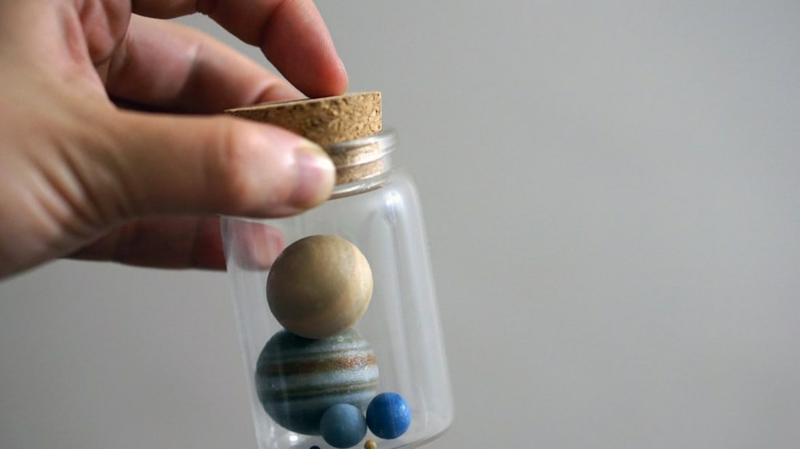 The online store creates and sells itty-bitty planets that you can hold in your hand. Their most adorable product might be a small bottle that contains all the planets of the solar system—which are at a scale of 1:5,000,000,000. That means Jupiter is the size of your fingernail, while Mercury is about the size of a speck of dust. You can get your own corked bottle here, but we caution you not to open it. If you lose track of that microscopic Mercury, you'll probably never see it again. Alternatively, if that possibility scares you, you can get this bottle, which uses "relative, logarithmic-like scaling," so the planets are all about the same size. Other fun objects sold by Little Planet Factory include terrains, moons, small celestial bodies, and custom prints. If you're looking to commission your own planet, you can scale an existing model or do a little research and create your own.